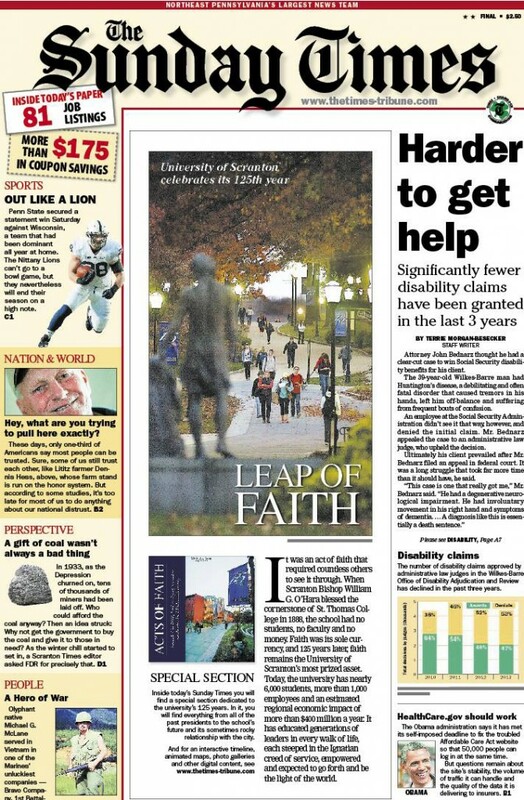 The Scranton Times-Tribune dedicated a special insert in today’s Sunday Times to the University’s 125th Anniversary celebration – with lots of great photos from the Times-Tribune files as well as images from our own University Archives digital collections. Check out the Times-Tribune website for all of the section’s articles, an interactive timeline, and a map of campus growth – or stop by the Library to take a look at the print version! 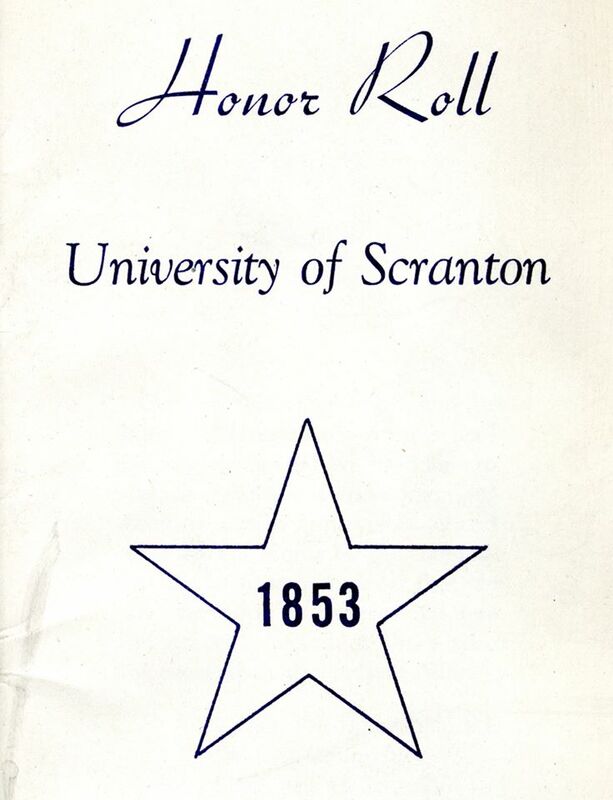 In honor of our many veterans: This Honor Roll booklet from January 1945 lists 1,835 University of Scranton students and alumni who had served in the armed forces. Find photographs, documents, news clippings, and more about the many veterans in the University community in our digital collections. For the past few months, we’ve been working on a giant digital collections project. 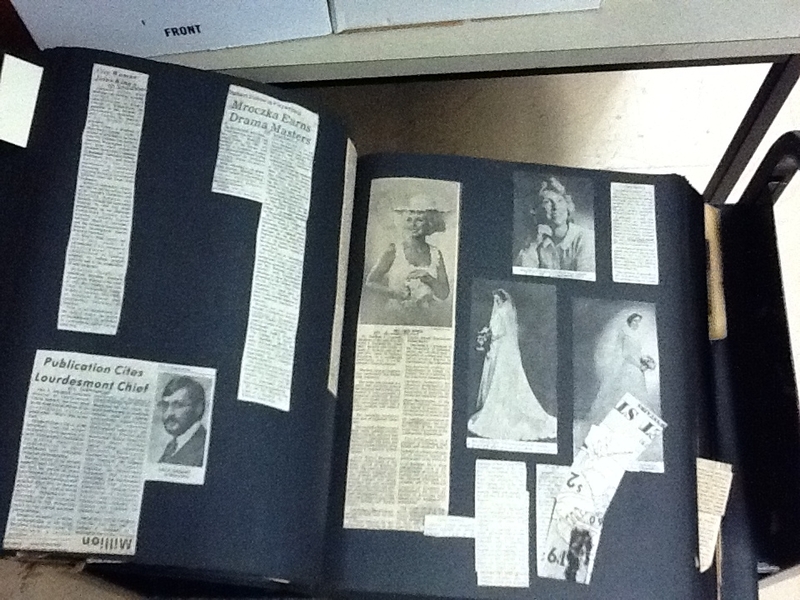 Earlier this year, in preparation for the University’s 125th anniversary, we digitized 97 oversized scrapbooks, filled with newspaper clippings about the University, that were hiding in our basement. 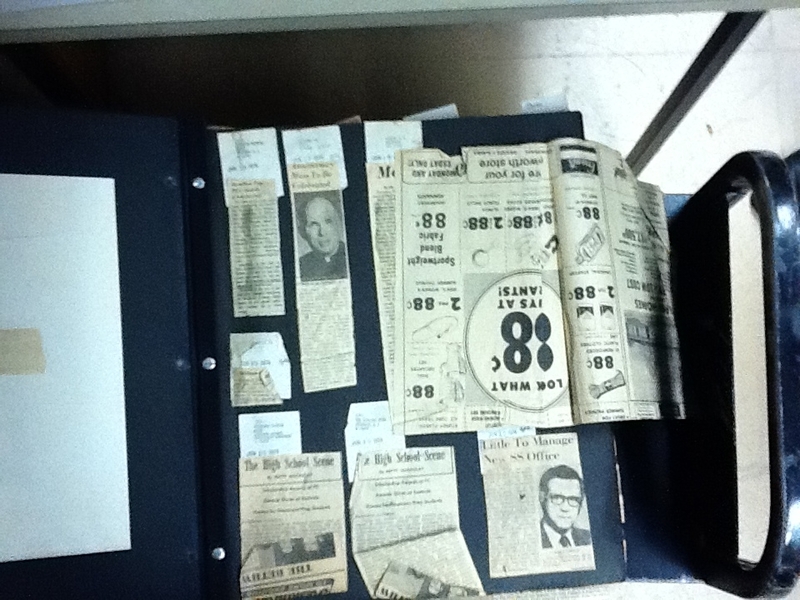 What we’re working on now is processing and cataloging the digitized images, to make them easy to browse and search. 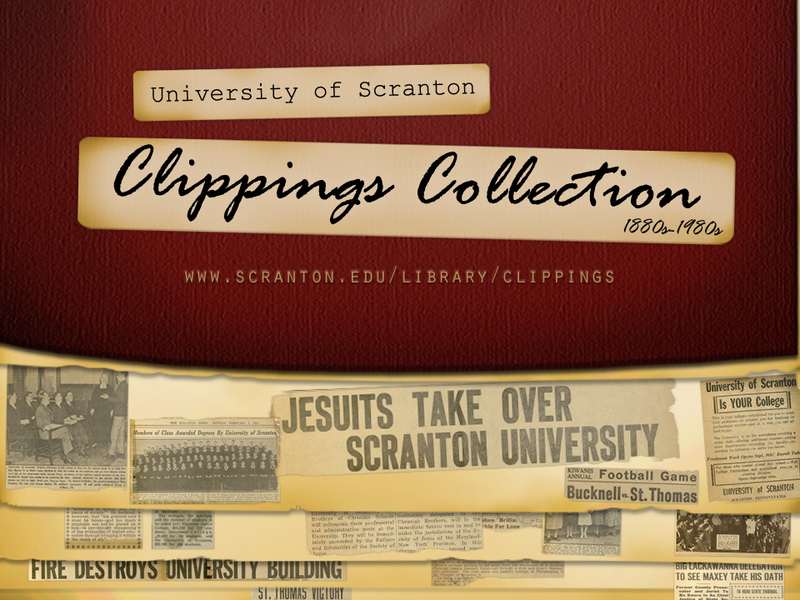 While we’re only about a quarter of the way done, you can take a look at our progress by searching and browsing 9,000+ articles from the 20 scrapbooks currently available in our new University of Scranton Clippings Collection. Note: Items in this collection are restricted to on-campus users only, but off-campus users will still be able to search and browse records for the articles. 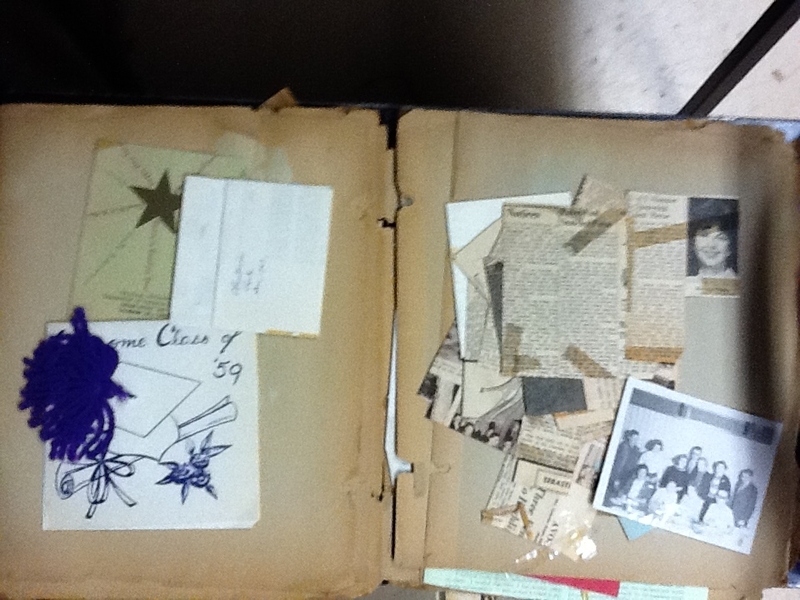 We’ll be adding articles from the rest of the scrapbooks throughout the year, so check back often! You can also send questions or comments to us at digitalcollections@scranton.edu. 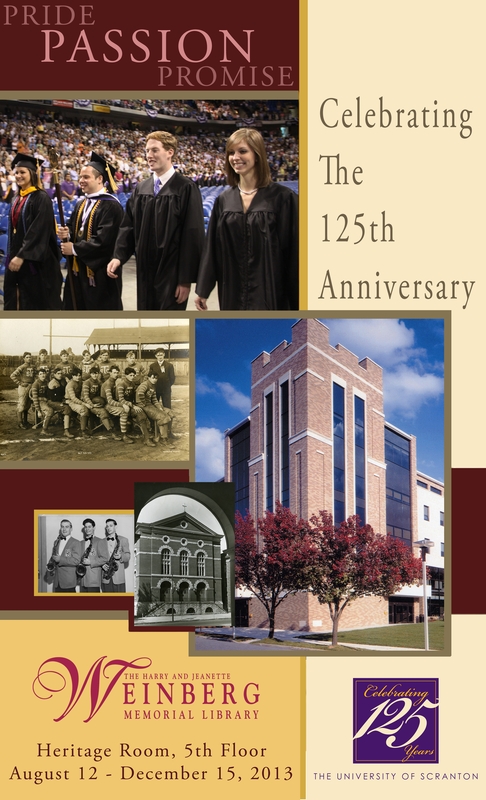 An illustrated history talk and exhibit reception will be held in the Weinberg Memorial Library on October 2nd at 6 p.m. in celebration of the 125th Anniversary of the University. 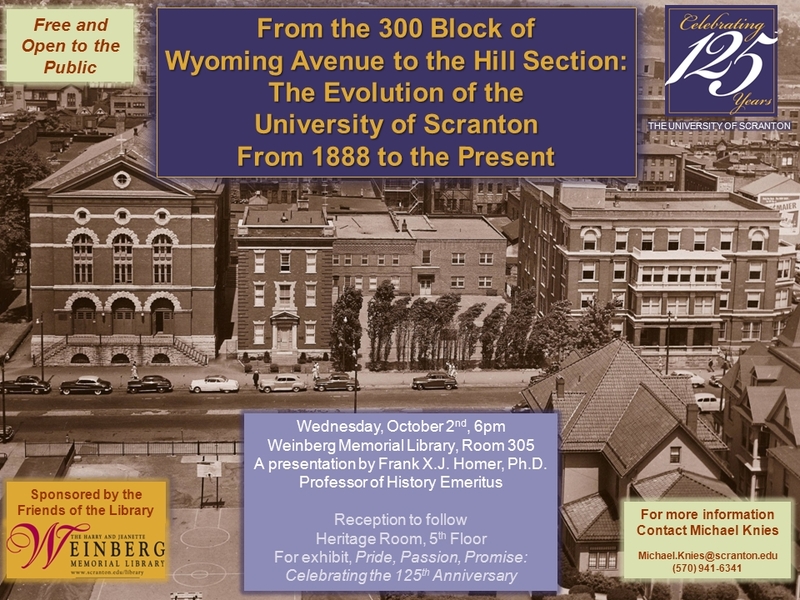 The presentation, titled From the 300 Block of Wyoming Avenue to the Hill Section: The Evolution of the University of Scranton from 1888 to the Present, will be presented by Dr. Frank X.J. Homer, Professor of History Emeritus. The talk will be held in Library Room 305. A reception will follow in the Library’s 5th Floor Heritage Room for the exhibit, Pride, Passion, Promise: Celebrating the 125th Anniversary. The event is sponsored by Friends of the Weinberg Library. 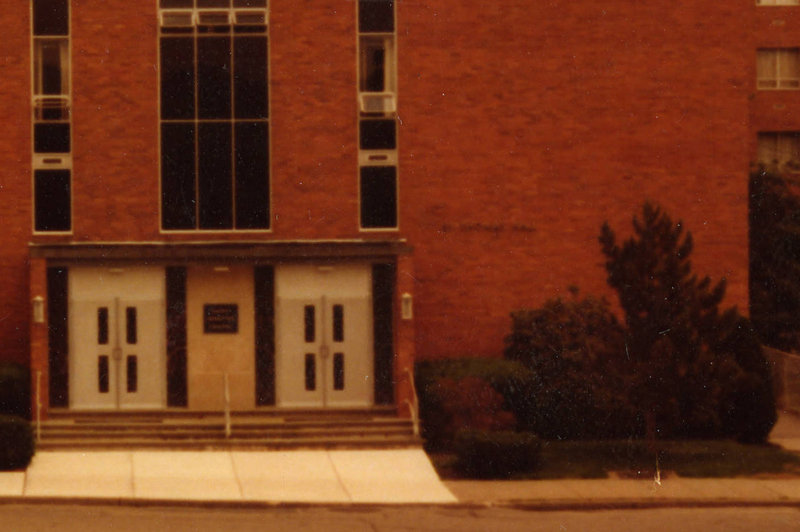 Visitors to the University’s 125th Anniversary website (125th.scranton.edu) will notice photographs, historic documents, and other materials from the Weinberg Memorial Library’s University Archives and Digital Collections. Library faculty, staff, and student workers contributed to the website’s timeline, photo galleries, and history pages, as well as the upcoming University history book and of course our Heritage Room anniversary exhibit. We encourage all our University community members to submit “Your Scranton Story” in celebration of the University’s 125 years. At the end of the year, we’ll be capturing the Scranton Stories in our web archives, preserving your memories for the 150th anniversary and beyond. 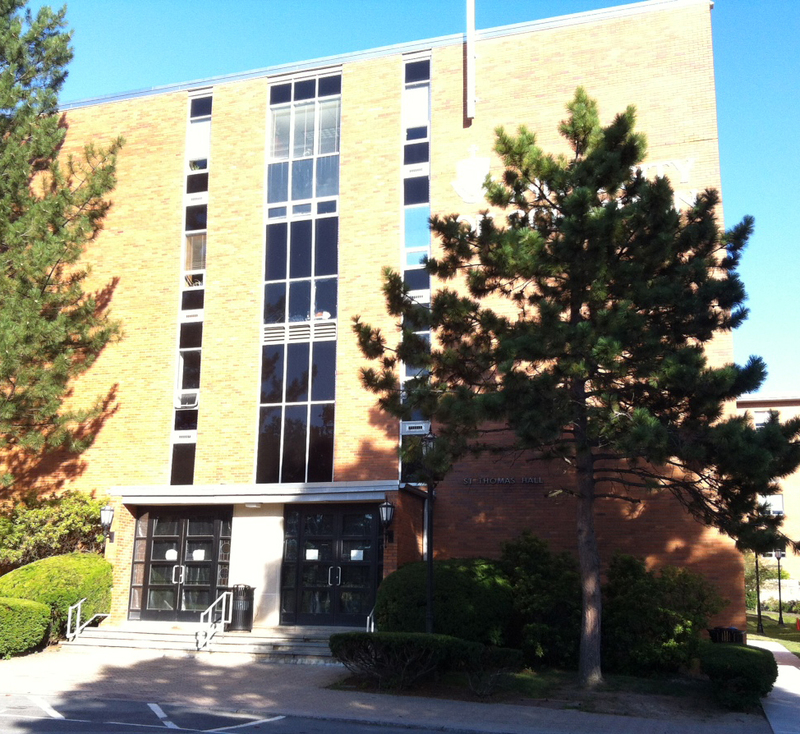 The Library’s current exhibit, Pride, Passion, Promise: Celebrating the 125th Anniversary, displays photographs, documents, and memorabilia from the founding of the school in 1888 to the present. It covers the range of activities that institutions of higher education engage in, including student life, the development of the campus, as well as the primary purpose of educating students. 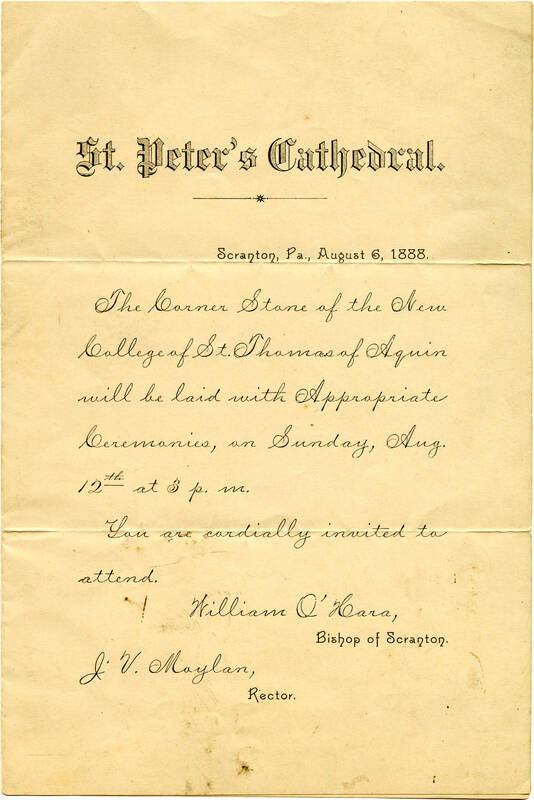 The University of Scranton begins its 125th Anniversary celebration this month with a special mass on August 12. 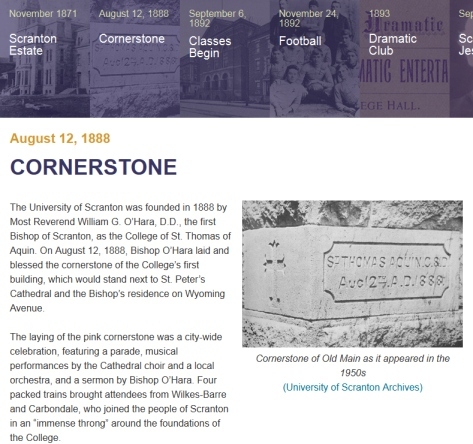 We know all true Royals take pride in the long history of the University of Scranton — but just in case your memory is a bit fuzzy, here’s a quick pictorial primer on the story behind our 1888 cornerstone, featuring materials from the University Archives and Digital Collections. The University of Scranton was founded in 1888 by Most Reverend William G. O’Hara, D.D., the first Bishop of Scranton, as the College of St. Thomas of Aquin. 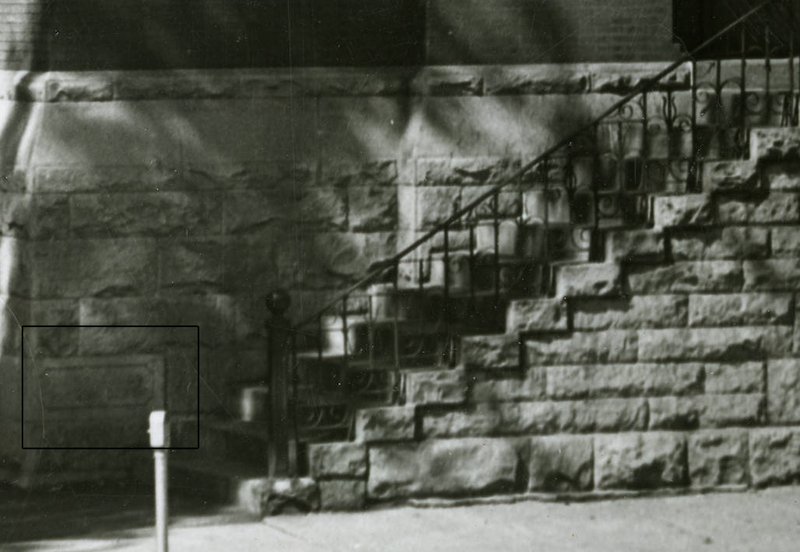 The cornerstone remained at the base of Old Main for more than 70 years. 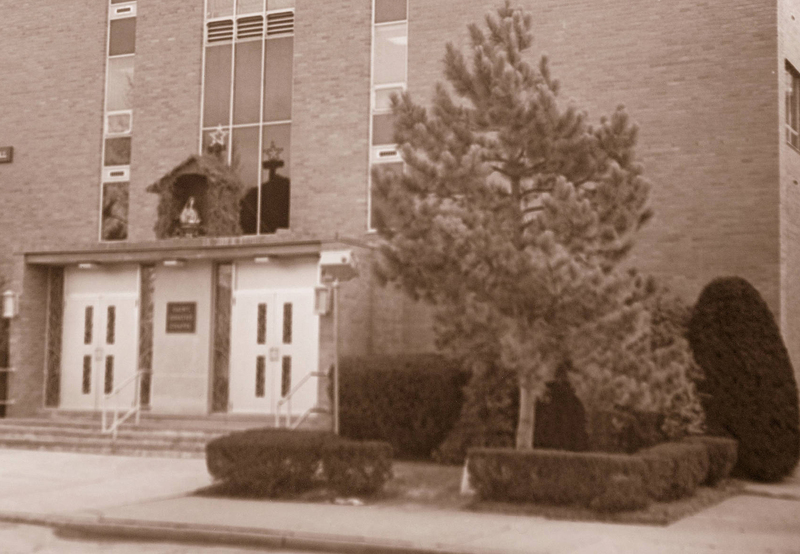 During that time, St. Thomas College evolved into the University of Scranton (changing its name in 1938), and the campus center shifted from Wyoming Avenue to the property surrounding the Scranton Estate, which Worthington Scranton donated to the University in 1941. 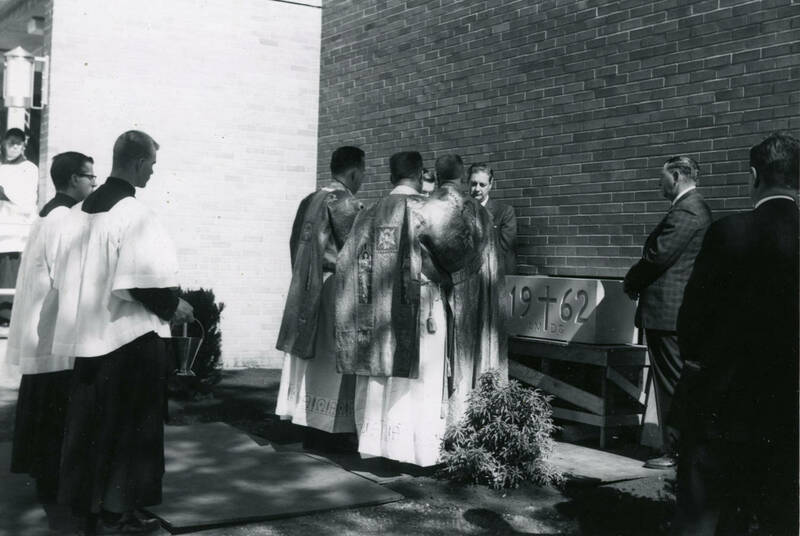 The cornerstone was removed from St. Thomas College to perpetuate those things for which it stands. 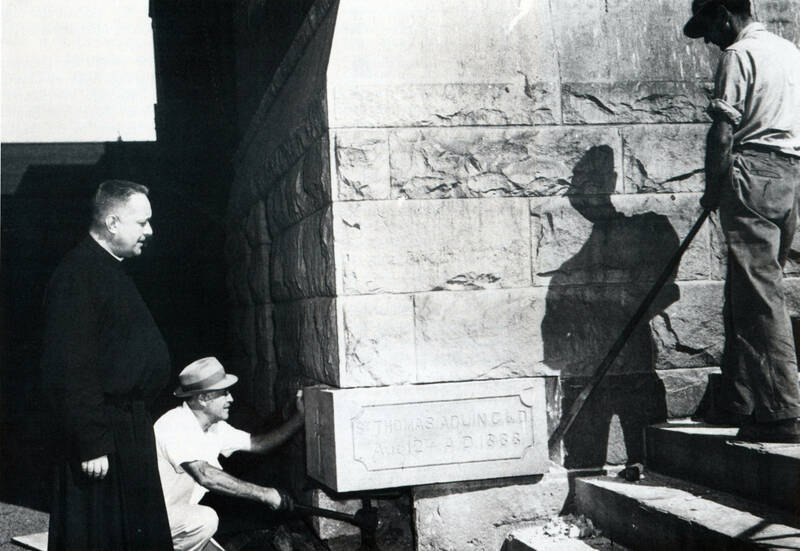 The intentions of the founding fathers and the service which its building has provided to higher education have all been carried with the stone to its new resting place beneath a new cornerstone in the walls of St. Thomas Hall. 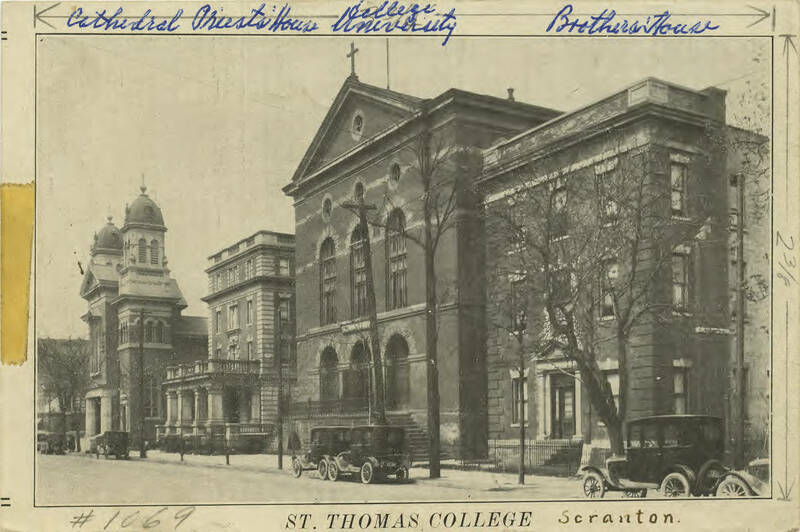 No edifice is stronger than its foundation, and the foundation of St. Thomas Hall and the University is in the ‘Old Main’ building and St. Thomas College. 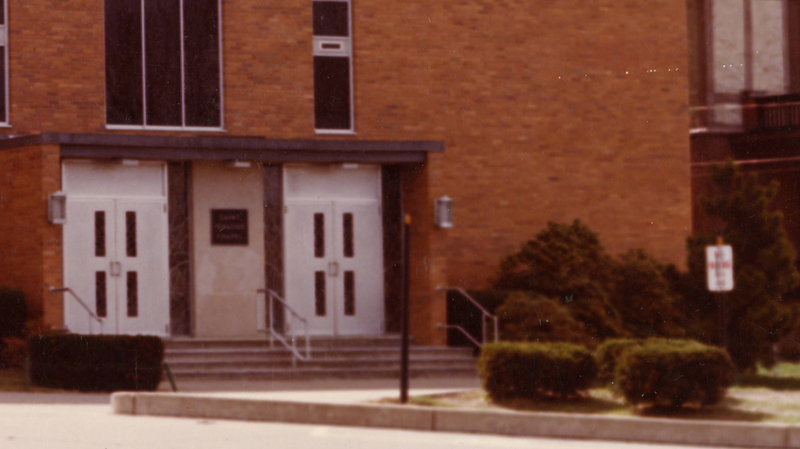 This is symbolically represented by the old cornerstone providing a foundation for the new, as St. Thomas College provides a foundation for the present institution. Along with the stone, St. Thomas College has given its name to the largest building on the University campus, providing a continuity to the history of the school by linking its past with its present. A special guest at the dedication was Dr. Martin T. O’Malley, who at the age of 12 had served as an altar boy at the 1888 dedication. He was the only person to be present at both the 1888 and 1962 events. 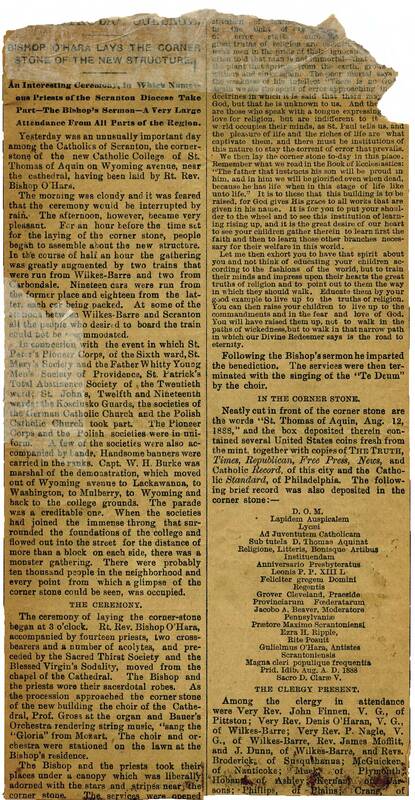 As part of the 125th Anniversary, the 1888 cornerstone has been dislodged from its 1962 placement and will be on display – location TBA – throughout the celebration. Keep an eye out for it, and be sure to take the opportunity to pay your respects to Bishop O’Hara and the University’s 125-year-old granite foundation. 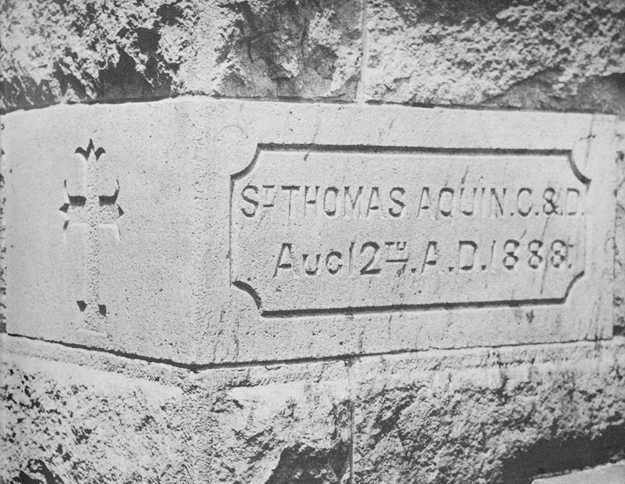 The cornerstone on display at the August 12 anniversary Mass. 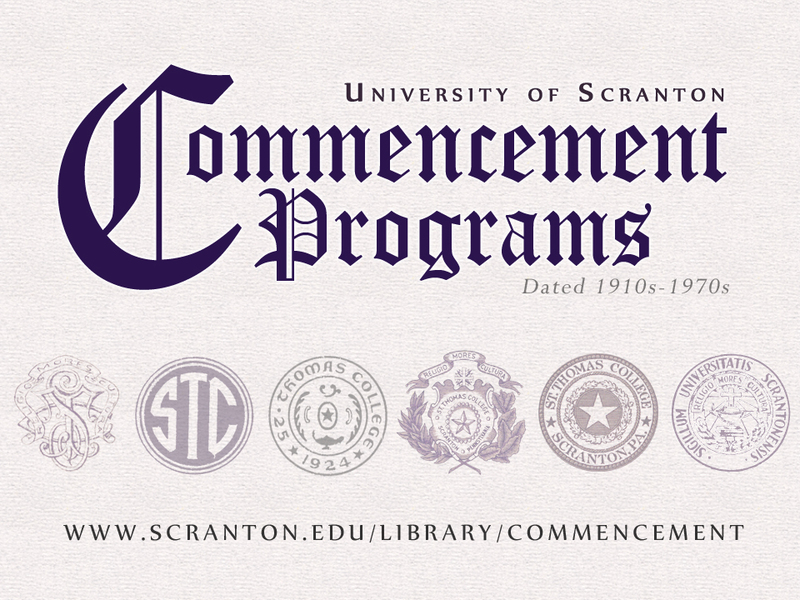 The Weinberg Memorial Library is excited to announce our newest digital collection – University of Scranton Commencement Programs – which includes programs from commencement exercises and related activities (like Class Night and Baccalaureate) held by the University of Scranton and its predecessor, St. Thomas College. Dated from the 1910s through the 1970s, the programs generally list names, degrees, and awards received by that year’s graduating class. Some programs also include biographies of honorary degree recipients. We’re still working on digitizing programs from the 1970s to the present – but due to privacy restrictions related to the Family Educational Rights and Privacy Act (FERPA), we are unable to provide public access to programs dated after August 1974 that include student names. (For more information regarding FERPA, please contact the Office of the Registrar.) The original, printed programs are still available in the Library’s Special Collections and University Archives, where they may be viewed by appointment. We hope that the collection will interest our alumni as well as our current students, faculty, staff, and friends. Please let us know at digitalcollections@scranton.edu if you have questions or suggestions for us, and make sure you take a second to browse through our other digital collections. 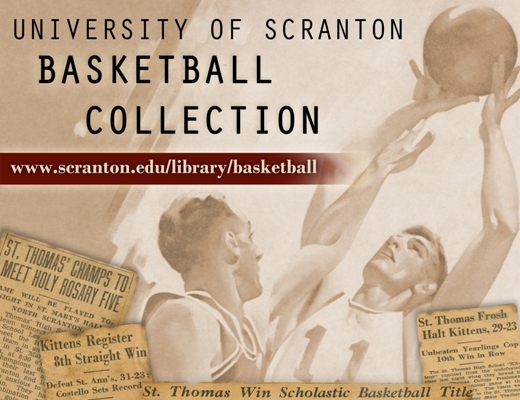 Here’s something we’ve been working on for a while as part of our ongoing digitization of materials from the University Archives: The University of Scranton Basketball Collection. We haven’t yet digitized the whole archival collection, but we thought we’d go ahead and make the part that *is* done available to all of you – especially with the University’s 125th Anniversary coming up! So far, the digital Basketball Collection includes more than 600 photographs and documents, dating from 1917 through 1979, that relate to basketball at St. Thomas College and the University of Scranton. 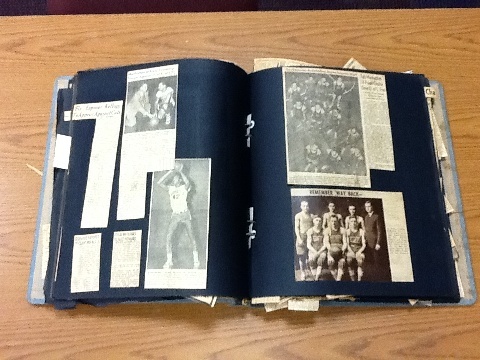 The collection includes team and player photographs, game programs, rosters, and selected newspaper clippings. Most of the material is from the 1920s-1950s, but we’ll be adding content from more recent years as we’re able to digitize it. Don’t forget, of course, that the original photographs and documents are available in the Library’s University Archives and can be viewed by appointment. We hope that the collection will interest our alumni as well as our current students, faculty, staff, and friends. Please let us know at digitalcollections@scranton.edu if you have questions or suggestions for us — or if you recognize one of our unidentified photographs! If you like what you see, make sure you take a second to browse through our other digital collections. Thanks to combined support from the University of Scranton’s Academic Affairs and Planning and Information Resources divisions, the Weinberg Memorial Library has partnered with Archive-It (a subscription service from nonprofit Internet Archive) to capture and preserve University-related websites for the enduring future. Part of the Weinberg Memorial Library’s mission is to “preserve and promote the history of the University,” and our University Archives has long collected and preserved photographs, documents, and other records from the past. Increasingly, though, our students, faculty, and staff communicate using dynamic digital media instead of paper or film. For example, the University’s undergraduate catalog is no longer a print publication but a database, and instead of finding printed newsletters in our mailboxes, we get our weekly University news digitally via Royal News. And unfortunately, this kind of web content is surprisingly vulnerable to digital degradation and loss over the long term. We could preserve a paper version of that dynamic information (say, by printing out Royal News each week) or take a PDF or image screenshot of it, but in doing so we’d lose its interactivity and searchability. Ideally, in the future we’ll want to be able to access archived web content the same way we access it now — that is, by browsing and searching. That’s where web archiving comes in. Archive-It’s web archiving service allows us to crawl and capture web pages in ways that preserve their dynamic and functional aspects – including active links and embedded media like images, videos, animations, and PDF documents. We’re certainly not the first ones to recognize the importance of web archiving in higher education. 97 other colleges & universities have already signed on with Archive-It, including fellow Jesuit universities Georgetown, Creighton, and Marquette, and fellow Pennsylvania schools Penn State, Drexel, and Bucknell. Several universities have created web archives that document important topics or events, like the American University in Cairo’s January 25th Revolution project or the University of Virginia’s collection of web and social media content relating to the resignation and reinstatement of President Teresa Sullivan. Here at the Weinberg we plan to focus our early web archiving efforts on our own University web content (like our main website and our athletics site) and the University-related social media sites (like our YouTube channel and many Facebook pages) where our community shares its stories. Over time, as we develop expertise (and hopefully secure recurring funding! 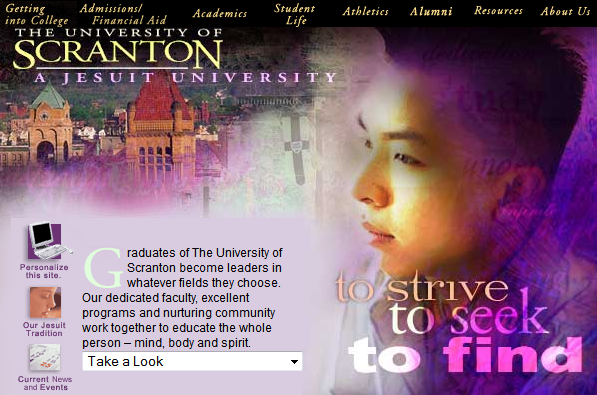 ), we’ll work with faculty to identify and explore the possibility of collecting external websites relevant to current and future scholarship at the University of Scranton. Our first step, though, is to seek input from our campus community regarding what is most important to preserve for the future. We invite members of the University community to send us questions, concerns, or suggestions. Take a peek at our first experimental crawls, and let us know if you’d like to be involved in web archiving at the University of Scranton! Internet Archive’s Wayback Machine has some snapshots of the University website dating back to 1998. With Archive-It, we can periodically and systematically capture and preserve the entire University website – and any other related web content our community needs.